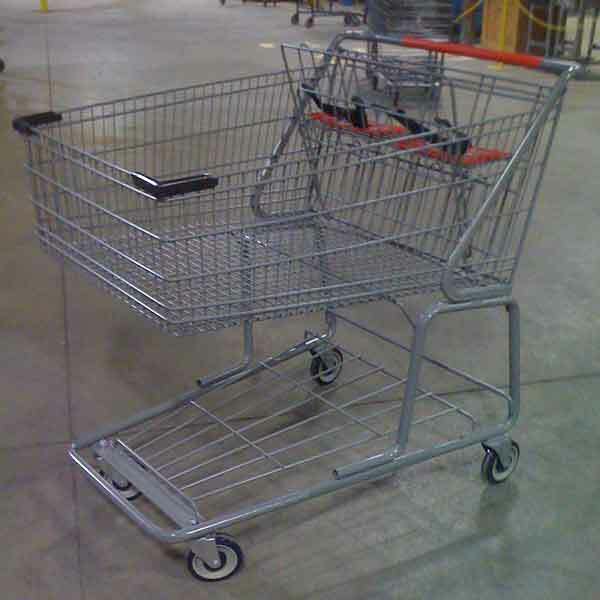 Used carts are utilized by some grocers to fill-in between new cart purchases; in many thrift and off-price stores; in industrial warehouses for stocking and order picking; and in high theft retail areas. We do not offer any warrantee or guarantee on used carts. The availability of used carts changes and we will try to post information of available carts on this page. Standard Used - Premier Carts occasionally offers some used carts for sale. The standard used wire or plastic carts will include basic cleaning, repair and touchup of original cart. Replacement of wheels, casters as needed. New plastic handle, leg hole closure, and seat belts are installed. Standard used carts are good functional carts, but will not have the consistent appearance of new carts. Recoated - Premier Carts occasionally offers some used re-coated wire carts for sale. The used wire carts are completely stripped of parts, original finish and then recoated with a new durable granite grey powder coated finish. New wheels, casters, plastic handle, leg hole closure, and seat belt are installed. Recoated carts are good functional carts and will have the consistent appearance of new carts. 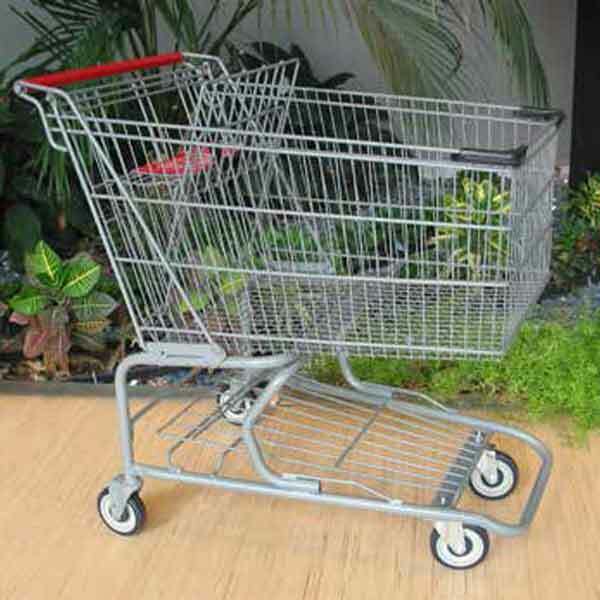 Used carts are sold by style, size and nesting ability and not by a specific make and model. Any models pictured are some of the most abundant models but the actual make and model of cart may change as the supply of used inventory changes. Some carts have a nickel chrome finish and some have a coated finish. We try to fill orders with the same make and model of cart, but can not always fill-in repeat orders with the exact same make and model of cart as a previous order. Most models of carts will have a similar size made by another manufacturer that will also nest together. If you are concerned about appearance, consistency or specific details, please consider our selection of new carts.